**Note–this review was written in stages–so it is created and formatted a little differently than previous reviews due to things I’ve learned along the way. 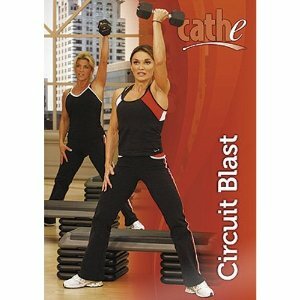 Circuit Blast is a rather unusual workout by Cathe. Initially, I was unsure how to categorize it; cardio or cardio + strength? It was created as part of the Shock Cardio Series, which was designed to complement STS, an all-strength series. However, there is some strength training in this workout. But not a lot and not great or thorough strength training. Some of it, I would classify as using weights to up intensity (metabolic weight training), but some of it seems to be genuine strength work. When I initially did the workout, I did it as a cardio workout so I used lighter weights than Cathe did. Still, there were moves that used a resistance band and you can’t fake that. I did think, after I’d already started the move, I should have grabbed one of my bands with less resistance instead of my heavy “go-to” band. I have more blathering to do before we get into the actual workout. Let’s start with equipment needed: a step that goes to 12 inches, a resistance band, dumbbells and a 6 pound medicine ball. I do not have a club step that adjusts with 2 inch blocks. I have a stupid Transformer, which can only be used at 6, 8 and 14 inches. So I, of course, had to substitute with my 8 inch step because I am no athletic freak of nature that could do these moves on a 14 inch step (**Actually… it looks like it is entirely possible that I could jump onto a 14 inch step–haven’t tried it yet, but see Review #2 below). Cathe has a lot of workouts that use the club step at 10 inches, some that use it at 12 inches and a few that use the top/platform which is only 4 inches. Well, let’s just say that since I am obsessed with Cathe workouts and that is all I do anymore, I am tired of modifying and not getting the full intensity of her awesome workouts. So I ordered a club step. However, it has not yet arrived. So, this review will be written in two parts. The first part I will write now, giving my impressions of the workout in it’s modified form—as a cardio workout with a shorter step (Transformer at 8 inches). When I do this work out again, it will be with a 12 inch club step and I will use the same weights Cathe uses. After I do it the way it was intended, I think I can determine if it is strength or just cardio/metabolic weight training. Oh—one more modification. I do not own a 6 pound medicine ball. I have a 4 pound medicine ball and an 8 pound medicine ball. I used the 8 pounder both times I did the workout. Circuit Blast is a 44 minute workout; 6 minute warm up, 33 minute training period and 5 minute cool down/stretch. Circuit Blast is set up in 6 rounds. The structure of those rounds is cardio, compound strength work and ending with functional core work. This workout has two premixes: cardio only 23 minutes and scrambled eggs 42 minutes. It is my understanding that the scrambled eggs is just the same workout, but with the rounds (or maybe the exercises?) “scrambled.” Then why is it 2 minutes shorter? I am very happy that there is a short cardio only premix. As I have gushed about in many other reviews, I love Cathe’s premixes. Just doing the cardio in this workout would be an intense little workout that would be perfect to tack onto the end of a strength workout. And actually, due to the length of Circuit Blast, doing the entire workout after one of Cathe’s shorter split series strength workouts would be a pretty cool, too. Review #1: As mentioned above, the first time I did this workout I did it with an 8 inch step and I did it as a cardio workout so I used lighter weight than Cathe did. As you can see from the breakdown, this workout contains a great variety of moves, so it wasn’t all on the 12 inch step and it didn’t use just dumbbells for strength work. The only thing I did that was more intense than Cathe, was I raised my transfirmer to 14 inches for the leg presses in Round #6. Overall, even with my modifications, it was still a great and enjoyable workout. It was not the intensity I am accustomed to in a Cathe workout, but it was still solid and fun. Personally, I would have liked the workout to be longer. But I suppose, if the object is to get in some quick cardio and strength, this would be a great workout. It was a great little cardio workout that I imagine will be even better with a step of the appropriate height! Even using the step at 10 inches would make the intensity jump. But we’ll see, won’t we? Review #2: I now own a club step and I love it! This morning I did Circuit Blast as Cathe intended it–with a 12 inch club step and using the same weights as Cathe did. This solidified my thoughts. First, even though there is some “strength” work–this workout is metabolic weight training (**more on this below). So it’s a cardio workout. And two, it is more intense with the 12 inch step and the heavier weights. They do up the intensity a good bit. I was a little nervous doing box jumps on a 12 inch step, but it was definitely easier than I thought! Not easy–but I had this mental images of not making it up on the step and crashing on–then off the step. Lots of pain. Silly fears, I can see that now. Even with the proper equipment I don’t think this workout is as intense as most Cathe workouts, but I attribute that to length. For it’s length it is a great little workout. If she added a few more rounds–or even created a longer premix–this workout would probably be as intense as her others. Nevertheless it is a winner. It is fun and I love it. **In my research of how Cathe classifies some of her workouts, I came across this post on Cathe’s forum, written by Cathe herself! Though Circuit Blast was not mentioned, Cathe’s response answered questions I had about several of Cathe’s other workouts: Afterburn and To the Max primarily, but also Cardio Supersets and Crossfire. Before discovering Cathe, I had rarely used heavier than 5 pound weights to add intensity to a cardio workout (two other trainers that I am aware of use “real” metabolic weight training–more on them below–and when I did their workouts, I used them as “strength” workouts even though that didn’t feel right either), so the fact that Cathe grabs 8, 10 and 15 pound hand weights during “cardio” workouts, gave me pause. However, I was never comfortable considering any of the workouts mentioned (including Circuit Blast) as strength workouts. Because as a strength workout they are incomplete. But you learn something new every day and I have learned so much doing Cathe workouts. I’m so glad I found her post, too, because it is exactly what I wanted to hear. I love her metabolic weight training workouts and the only thing that would keep me from using them as often as I want to is if I had to count them as my strength workout. But now I can feel good about using them as cardio! There are other trainers I have come across who use metabolic weight training in a similar fashion to Cathe, and when doing their workouts I had the same uneasiness. Bob Harper and Michelle Dozois. I love their workouts–they are tough and they give you results–and metabolic weight training is apparently why! Actually, Jillian Michaels uses metabolic weight training, too, but in her Body Revolution she does give rest days between muscle groups. However, in most of her stand alone workouts like Ripped in 30, she recommends doing the workouts every day–which again, confused me in the past, but not nearly as confused as I was by Bob and Michelle; Jillian doesn’t use heavy weights in her workouts. The heaviest weight she ever uses in her workouts are 8 pound dumbbells (though I always use heavier than that when doing her workouts). Bob Harper’s Cardio Conditioning and Ultimate Cardio Body use lots of dumbbells and not 5 pounders! 10+ pounders! I never felt right using them as cardio workouts. However, at one time he had a rotation calendar for his Inside Out Method workout series available and on it Cardio Conditioning is used the day after and/or before strength workouts. And until I did Michelle Dozois Peak Fit Challenge, I used her Peak 10 Cardio Strength workout as a strength workout. But then I did Peak Fit Challenge, which is a program that contains 10 workouts. It comes with an 8 week calendar telling you exactly what workouts to do each day. And her Peak Strength workouts are done the day after or the day before a Pure Strength workout. At the time, I couldn’t understand why they were set up this way–but I also assumed that since they were successful trainers, they must know something I was not understanding.